Welcome aboard! We are the Massachusetts Bay Council of the Navy League of the United States. The Navy League of the United States was founded in 1902 with the encouragement of President Theodore Roosevelt. 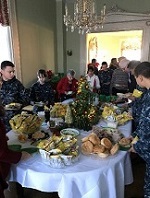 The Navy League is unique among military-oriented associations in that it is a civilian organization dedicated to the education of our citizens, including our elected officials, and the support of the men and women of the sea services and their families. 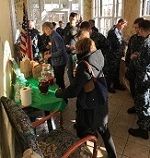 Further information may be obtained by visiting the web site www.navyleague.org. 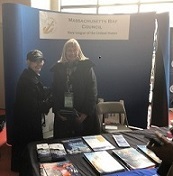 The Massachusetts Bay Council, as chartered by the Navy League of the U.S., is a non-profit, educational, 501.c.3 organization with roots back to 1955; With over 500 members and not charging any local dues, we support our Sea Services in many ways. 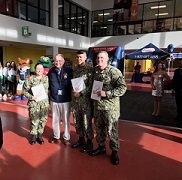 We make many awards to Navy, Coast Guard and Marine personnel, as well as NROTC and JROTC units in eastern Massachusetts, sponsor nine Sea and League Cadet units, sponsor a Maritime Symposium for college students, raise funds for the Marine Toys for Tots program, and much more. We keep our members apprised of legislation affecting Sea Services and encourage them to communicate with their Senators and Congressmen. We sponsored commissioning of USS THOMAS HUDNER (DDG 116) on 01 December 2018, USCGC JAMES (WMSL 754) in August 2015, USS SAMPSON (DDG 102) in 2007, USS PREBLE (DDG 88) in 2002; and previously, USS RAMAGE, USS BUNKER HILL and USS SAMUEL ELIOT MORISON; as well as assisting the Coast Guard with several other commissionings. NAVY LEAGUE DUES are only: Regular Member $55; E-Membership (everything on line) for $25, and other categories. Opportunity to recruit new members or give a gift. Applications are found at https://join.navyleague.org. USS THOMAS HUDNER (DDG 116) COMMISSIONING: Named for the Medal of Honor recipient and Member (now deceased) of our council. On a chilly December 1, the newest warship in the U.S. Navy was brought to life. 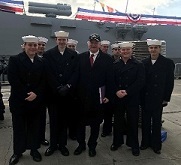 Some 6,500 visitors braved the cold to honor the ship’s namesake and view the ceremonies and tour the ship. The Commissioning Committee, sponsored by the Massachusetts Bay Council, was chaired by Council President Tom Hennessey. Full story is in THE SHIP‘S WHISTLE, December 2018 (link on left sidebar). THE ANNUAL MEETING AND ELECTION OF OFFICERS was held 19 November 2018: Elected were: President: Stephen Schnitzer; 1st VP: Bill Malloy; Treasurer: Michael Sharp; Clerk: Al Prudhomme. VPs: Genevieve Guimond, Harold Learson, Harriett Learson, John Learson, Tommasina Olson, Reid Oslin, Eleanor Samuels, Ivan Samuels, Krys Maksymowicz, Lauren Beagan, and Paul Mahoney. The Board includes the officers and Jeffrey Ahlin, Larry Allen, Mary Jo Majors, James McLaughlin, George Ripsom, Tom Rudden, Chris Donohue, Steve Boodakian, Tom Hennessey, John Tata, Bob Powers and Paul Keane. Navy Birthday Dinner on October 18, 2018 featured CAPT James P. "Jamie" McGrath, USN, Military Professor, Joint Military Operations Department, Naval War College, Newport, RI, who addressed building toward a 355 ship Navy compared to the rebuilding of the US Navy in the 1930s. 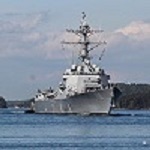 ​ For Sea Services News and Legislative Issues important to the Navy League, visit http://www.cqrcengage.com/navyleague. Congressional Contact Information on "Contact Us" Page. Where: Barnes Building, 495 Summer Street, Boston, MA. Advise Stephen M. Schnitzer, President, Massachusetts Bay Council, if you plan to attend because your name must be listed in advance. 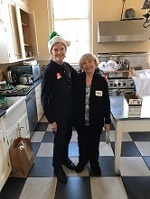 Contact Stephen M. Schnitzer by e-mail at 1smschnitzer@gmail.com or by phone to 617-227-4968. Amazon will donate at no cost to you 0.5% of your purchase price, Select Navy League Of The United States Massachusetts Bay Council as your Charity.